The front of the cabinet consists of rails (horizontal members) and stiles (vertical members). These members fulfill two functions: they support the cabinet doors, and they form the finished front. A diagram of their placement is shown in Figure 4. It is very important that you install each of the stiles and rails so that they are all exactly square, or your drawers and cabinet doors will not fit properly. Cut one 35-1/2-inch-long top rail (E) from 1x4 pine. Using glue and two finishing nails on each end, attach the top rail (E) flush with the top edges of the cabinet sides (A), as shown in Figure 4. Cut two side stiles (F) from 1x4 pine, each 30-1/4 inches long, and attach them to the cabinet sides (A) below the top rail (E). Use glue and 3-penny finishing nails, spacing the nails about 6 inches apart. 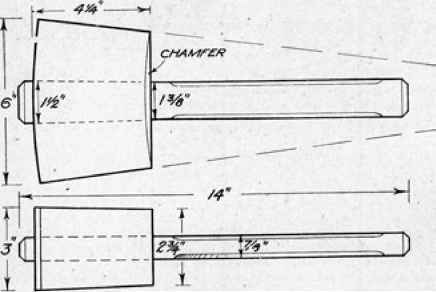 As shown in Figure 4, the stiles should be flush with the outer edges. Cut one 28-1/2-inch-long center rail (G) from 1x4 pine, and attach it 4 inches below the top rail (E), between the two side stiles (F). After applying glue, toenail the center rail (G) into the side stiles (F) using two finishing nails on each end. From 1 x 4 pine, cut one 4-inch-long upper center stile (H) and one 22-3/4-inch-long lower center stile (I). Attach the upper center stile (H) between the top rail (E) and the center rail (G), as shown in Figure 4. Apply glue, and toenail the center stile (H) into the top rail (E) and the center rail (G), placing two finishing nails at each end. The lower center stile (I) is attached to each of the shelves (C). Make certain that both of the shelves (C) are perfectly level in the center. Use glue and two finishing nails to attach the lower center stile (I) to each of the shelves (C). Glue and toenail the lower center stile (I) to the center rail (G). Cut a 35-1/2-inch length of 1 x 4 pine. Rip the length to 3 inches in width, and attach the resulting bottom base piece (J) across the bottom edge of the assembled cabinet so that it covers the raw, bottom edges of the cabinet sides (A), as shown in Figure 4. To secure the attachment, first glue all of the exposed joints. Then use two 3-penny finishing nails to toenail the bottom base piece (J) to the lower center stile (H). Next, with two finishing nails on each end, attach the bottom base piece (J) to the edges of the cabinet sides (A). Finally, nail through the lower cabinet shelf (C) into the bottom base piece with finishing nails placed about 6 inches apart. Cut four shelf trim pieces (K) from lxl pine, each 12-1/2 inches long. Use glue and finishing nails placed every 6 inches to attach the shelf trim (K) to the exposed fronts of each of the shelves (C) between the stiles (F and I).